Princess Kitty’s hopes of getting married to dashing Count Alexei Vronsky, are dashed when he meets Anna Karenina quite by chance in a train bound to Moscow from St. Petersburg. Anna is traveling to fix her brother’s marriage which has been damaged by his frequent indiscretions. When Count Vronsky encounters Anna a few too many times, a maddening attraction flourishes between the two that threatens their standing in society and ends up tragically as she leaves her husband and is ostracized by members of her social circle. 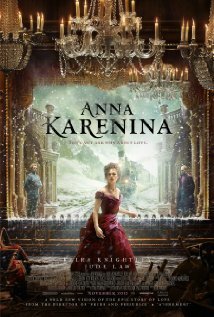 This 2012 adapted version of Anna Karenina, the novel penned by Russian novelist Leo Tolstoy, is the first one I have ever seen. I haven’t read the source material either so I have only the movie to rely upon. This film version is directed by Joe Wright and starred by Keira Knightley in the role of Anna, Jude Law as Karenin—Anna’s husband--, and Aaron Taylor-Johnson as Count Vronsky. Also Matthew Macfadyen co-stars as Oblonsky, Anna’s brother. I must say that though I didn’t feel the chemistry between Keira Knightley and Aaron Taylor-Johnson —it’s not in the same league as the chemistry between her and Matthew Macfadyen in Pride and Prejudice or the incandescent spark between Knightley and James McAvoy in Atonement--, I did feel in some sort of shock by the end of the movie; it was the power of the story and its tragic ending. It’s that after so much loving and sacrifice, it all went to waste; the relationship between Anna and Alexei was shattered, imploded by the demands of society and its pressures. I did like the story. It is quite a powerful one and I somehow get easily carried away when love ends tragically; those stories really move me. However, I didn’t think this movie was that good. It is portrayed in a theater-like format, the changing of stages and costumes occur as in the theater, not like in a fluid movie; I found that very archaic and I think it stole the film of its power if not of its drama. Overall, Anna Karenina is a period piece worth watching more for its literary value than for its cinematographic virtues. Carmen, I loved this book and have read it several times. Don't think I've seen the video. Have a great week. This movie is new; it was released on November of last year. It's possible that by now is on DVD. I didn't think it was that good, but I intend to read the book sometime since I really liked the story.